I do apologize. I’m a horticulturist and garden writer; I never pretended to be a technology whiz. Many of you found that the final Daylily picture, in the last issue of ‘Dallying In The Dirt’, slid across the page and covered some of my wonderful words. I have no idea how that happened but will try not to repeat the feat. When the weatherman talks about thunderstorms and “isolated” showers, I certainly understand what he means. Despite being deluged by rain, while spending a few days away from the garden at a lakeside cottage, the garden itself received less that 0.5 inches of water. I actually tested the rain gauge to make sure it wasn’t leaking. Ran the sprinkler, on the part of the garden that is mostly vegetables, for about three hours and managed to give it all about 0.5 inches of water. Most of it is looking quite healthy. 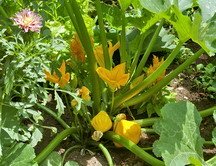 The various summer squash, Patty Pan (pictured right,) and Eight Ball Zucchini, are certainly thriving. I could feed a small village on the harvest from about 6 plants. It is almost time to start dividing and moving some of the Iris and Daylilies and I can see where a couple of squash plants may have to make the supreme sacrifice and donate their garden space to some of these interlopers. I’m discovering , many duplicates among my Daylilies and most of those are going to be thinned out. There are a few older clumps, probably more than 7 years old, that are simply not doing well anymore or are taking up more space than they deserve for the amount of flowers that they produce. They will be dug divided and renewed. I also have to deal with a certain amount of bad planning on my part. Too many plants in too small a space. So that they will all have room to thrive, somebody has to move. The Asparagus and Peonies are the most permanent perennials so the more easily moved Daylilies and Iris will be finding new locations where they have the room to perform better. I particularly find that my beloved Iris do not seem to enjoy the crowded conditions. It’s also time for the big summer shift in the vegetable department. Peas, early Lettuce, Kohl Rabi and a few other early summer delights are now finished and they will be pulled and added to the compost. 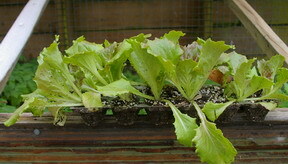 In their place the late Lettuce, (ready on the left,) Broccoli and Cabbage, that are developing in the cold frame, will be planted. Maybe this is the year to once again see if I can actually produce a late crop of peas. Theoretically this is possible but I have never managed to do it successfully. My two Dahlia plants are doing quite nicely this year and now comes the hard part. Do I want to have a lot of flowers to brighten up the fall garden or do I want to have winners at the fall fair. 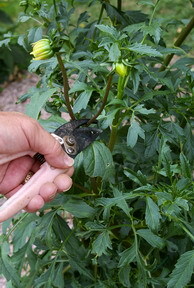 To get the latter I have to go out and chop off side branches, (picture right,) removing the axillary buds and generally forcing the plants to put all of their energy into producing a few very large blooms. It is so difficult to cut off perfectly healthy, flower producing, branches but sometimes we must sacrifice for the greater glory. For the most part I seem to be winning, or at least not losing, the constant battle with the Red Lily Bugs and the equally devastating Iris Borer. Both of these creatures require continuous visual examination of the host plants. Once you get into that rhythm and learn what to look for, it really isn’t that difficult. The Iris Borer is, by far, the more difficult because you can only see the damage you cannot see the insect without cutting the leaves open. How do I prune my tomatoes to get the most production. I don’t want to cut off any fruit producing branches. Ken Answers: Like many gardening questions there are a variety of answers. There are a few different ways to grow Tomatoes. 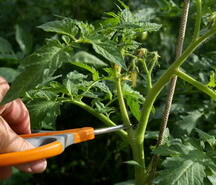 The one that requires the most pruning is the single stalk method. The trick to the pruning is to keep track of the central stalk, to twist around a string or tie to a stake, and then to remove all of the axillary shoots. One of these side shoots will develop at the base of each leaf and the smaller you can catch them and prune them the less energy they will steal from the main fruit producing stalk.